Are you one of the lucky residents that get to call Northridge home? Living in Northridge has so many advantages that the residents get to utilize! The city of Northridge is known for its friendly communities, wonderful parks, and even better schools! The weather in the area is always sunny and comfortable, it’s no wonder so many people choose to live in the area! The city is referred to as the “Jewel of the San Fernando Valley” and it’s easy to see why! The residents get to have the best of both worlds, living in Los Angeles without having to deal with all the hassles of city life, having the comfort and perks of a suburban community. The filter for your air conditioning system is one of the most important pieces of the entire system. The filter allows for the system to receive the proper clean air it requires. When a filter begins to get clogged with debris, the amount of air flowing through the system diminishes greatly. This can cause the unit to work much harder to produce the same amount of cool air. Sometimes this can cause the system to break! Be cautious and replace your filter every 3 months to assure a clean healthy air conditioning system. We recommend signing up for an air filter delivery subscription, this will remind you to replace your filter frequently because you will receive filters in the mail every so often. The second biggest tip we can give to the Northridge community is servicing your unit regularly! Much like a car, it’s important to take care of any trouble when it’s still minor. This will avoid the problem increasing in magnitude and save you an expensive repair bill down the road. Having a professional evaluate your system will ensure that any problems will be caught before they become major issues. Regularly servicing the equipment helps to extend its life and ensure that it will stay in great condition for as long as possible. 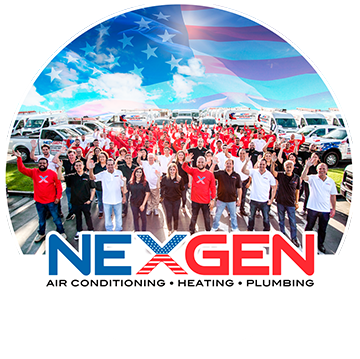 Our experts at Nexgen only suggest the best possible solutions for your HVAC problems and our professionals do a great job keeping you, the customer, happy. Our goal is to provide our customers with optimal home comfort solutions paired with efficiency and safety. Just like a clogged air filter, a blocked vent or airway can cause major issues with your HVAC system. It is best to check for blocked vents or airways every so often, but a great time to also check is when you run your air conditioning for the first time since winter. People usually go pretty long from when they last used their furnace to when they first use their air conditioner. During this time, things can move around in your system and that can obstruct the vents that provide cool air to your home. This can cause the unit to overwork and break. Also, if there is any furniture blocking the vents, take the time to rearrange the layout. Make sure that air can freely flow through the room! When those cool summer days roll through, it is actually best to leave your system on. When you turn your system off, it takes an excessive amount of energy to get the system up and running again once you turn it on again. If a cool spell rolls through, we recommend setting your thermostat to 78 or 79. That way, your system won’t run but it will be ready once that heat wave rolls back into town! This allows for the unit to work less hard to get the house back down to the desired temperature. One thing many people forget to do is using ceiling fans! Ceiling fans are especially good at moving cool air where it belongs! Running your ceiling fans while your air conditioner is on can actually allow for better airflow in the home, moving the hot air upwards while allowing cool air to stay where it belongs. Have you ever had an issue where certain rooms are not receiving a proper amount of air while others seem to get a whole lot? This usually is an issue that arises around having your system incorrectly sized for your needs. But there is one tip that can help you get the air you want and need! Try strategically closing air vents in different areas of the house. If you are hanging out upstairs and are not receiving air, try closing some vents downstairs. This will allow for more air to flow upstairs, which can direct the air to where you want it to be! Sometimes this trick takes some practice to understand which vents to close to best adjust air flow, but practice makes perfect and in no time you’ll get the hang of it! Just as you dump your trash, your air conditioner condenser needs to be cleaned as well! Trash, sticks, dirt (you name it!) can get stuck to your condenser. It is best to frequently check to make sure everything is all clear! You can even use a garden hose to clear off the debris. Just be extra cautious with the fins! These are just a few tips you can use to safely get the most out of your air conditioners! Put these tips into practice and see just how efficient your air conditioning system can get!